In a small bowl, add the mayo (add sour cream if desired), mix in all the spices and use as is for dip, or slowly add milk while constantly stirring til desired thinness is reached for salad dressing. Let set 30 minutes to blend flavors. Make the dressing first, cover and keep in fridge. Cook the noodles until al dente, drain under cold running water and place in large bowl. While the noodles cook, steam the broccoli until just tender, then drain under cold running water and place in the bowl with the noodles. Do not let the noodles or broccoli get mushy. Chop the crab into small bits and add to the bowl. Pour the dressing over the top, mix in, and refrigerate for an hour or more to completely cool and allow flavors to blend. This sounds great, I will definatley be giving it a go in the next couple of days. Thanks for sharing this with us, I’ll be sure to tell you how it goes down with the rest of the family. I’m a recipe junkie…I always look on the net for good food recipes and try them out…I’ve tried many in the past but your Crab salad is insanely delicious! haven’t tried yet the homemade ranch dressing, but I definitely will. Will follow your recipes from now on…they’re so worth it! This looks yummy. I love both crab and mayonnaise so it’s a great combination. Wonder if shrimp would be good in there too. Sounds dee-lish but do you have the calorie/fat counts? 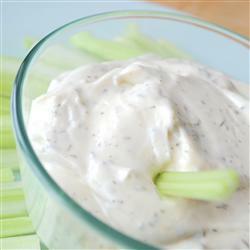 This Ranch dressing dip looks amazing!! I can’t wait to try it out this weekend for Sunday dinner. All I have to do is make sure to get a lot of crab. Like you said up top…depending on the crowd i’m serving….I definitely would need more crab with my family :). Thanks again for such great tips. and a small shout out to @Jessica for putting up the calorie count.